M Hudon, R Pagés, M Grogan, and A Smolić at Trinity College Dublin (Ireland) published last September a beautiful paper: "Deep Normal Estimation for Automatic Shading of Hand-Drawn Characters" and they decided to use the hand-drawn sources of Pepper&Carrot to run their test and illustrate the paper. I was very flattered to see Pepper and Carrot featured in this well-made study! This research made me think of the 'Illuminate 2D shape' GMIC filter we have already in the FLOSS community since May (something I never really played with). While this new auto-shading method might not be useful for me for shading characters (I prefer to do it myself), it might be super useful for a large scene with crowd, particles (stones, drop of water, magical effect, clouds), or many small objects (like my episode with hundreds of flying potions). In the conclusion, the authors wish to see their method (with more training of the neural network to reach a higher quality) being incorporated into the animation pipelines to increase productivity of high quality series and movies. For sure, these types of tools have a lot of potential. with a special permission to republish here, 3 december 2018 . You are featured in yet another paper from Japan, too. Does this mean that digital colouring is automated? Hi, it doesn't mean anything in itself; it means a couple of researchers trie to emulate 'shading' (the process of adding shadow and light) to a drawing. 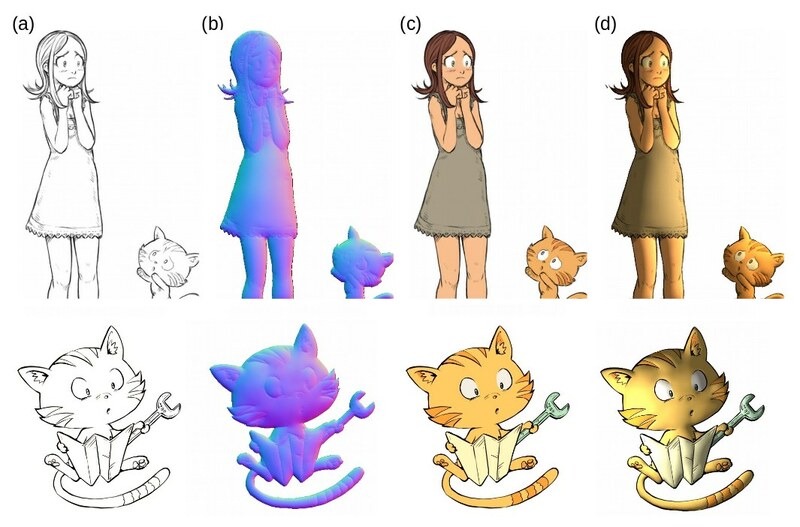 We are still really far of full automated coloring and shading ; and by the way I see evolution of automation, algorythm and neural network, we will wait for decades before looking at a code knowing how to replace the job of a beginner colorist. But this researchs are nice; and a small step on a long long road. I appreciate scientist who are brave enough to enter that challenges! If this can be implemented as a graphics pipeline shader it may be possible to use it for 2D games using cutout animation. Very interesting way to shade 2D sprites.